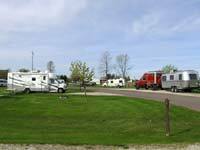 On most occasions when we've visited Madeline Island, we've taken our motorhome as we were staying more than one day. 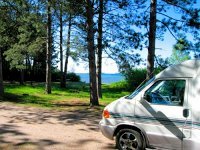 But if your visit is only for the day, you can cut the ferry fare by more than half by taking the ferry as a passenger without your car or motorhome. 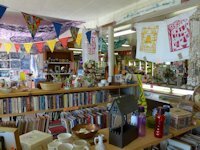 Most everything of interest is within walking distance: artisan and specialty shops, restaurants, coffee house, taverns, Madeline Island History Museum, and more. If you want to tour the island you can rent bicycles or scooters and still come out money ahead. 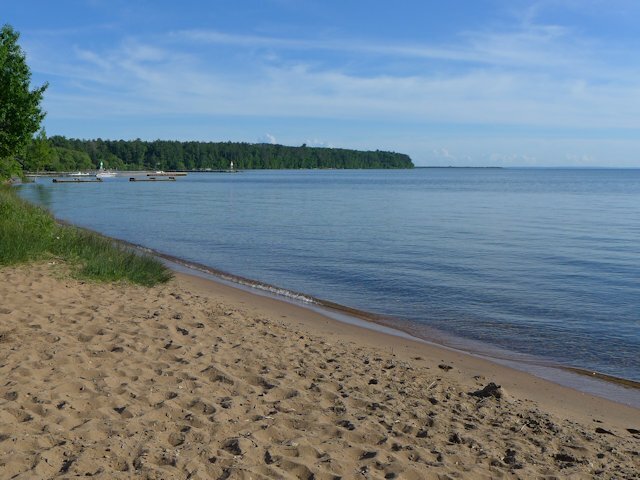 Madeline Island, the most southern island of the Apostles, is steeped in history - both for the Ojibway-Anishinabe peoples and Europeans who later founded trading posts, missionary outposts, and eventually the town of La Pointe. The Objibway occupied the area for several hundred years prior to encounting French exployers in the 1600s. The first European trading post was founded in 1693 by Pierre Le Sueur on the south end of the island which he operated until 1698. More than a century later the American Fur Company built their post at essentially the same spot. 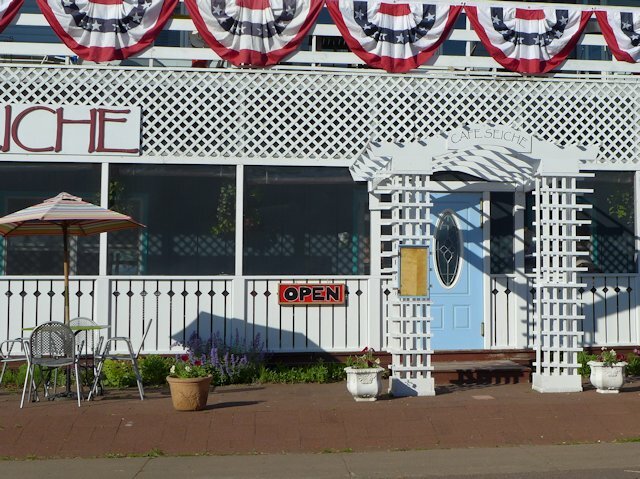 The Madeline Island Historical Museum now occupies this same historic ground. On our most recent visit to the island, we were disappointed to discover one of our favorite dining places, The Bell Street Tavern, had closed. Lots of rich woodwork and attractive ambience, plus decent food and service. But Tom's Burned Down Cafe just down the street is still going strong. Formerly Leona's Bar that did in fact burn down & then rose from the ashes like the Phoenix to become the creation of Tom Nelson. The "classy" front lawn of Tom's Burned Down Cafe. The sign advertises "Good Fast Cheap Food." Well I think I can agree about the "cheap" but don't think I'd risk finding out about the rest! 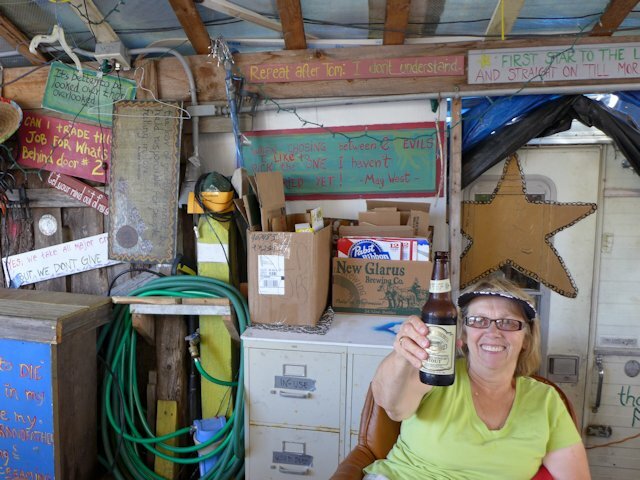 If Cafe Seiche is for the discriminating diner, Tom's is the anti-Seiche - Good fun and merriment for the indiscriminant patron! If you drop something on the floor, someone's pooch will take care of it for you. Gets 4 to 5 stars for quality of food & service, but also upscale in price. 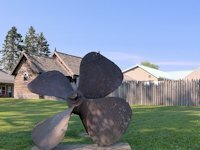 The propeller from the former tugboat Ashland decorates the front lawn of the Madeline Island Museum. 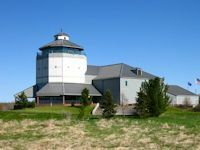 The original museum buildings were created from four historic buildings on the island brought together on the museum site. 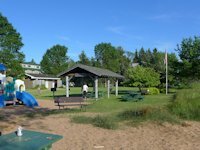 It includes the last remaining structure (1835) of the American Fur Company complex, an old Madeline Island Barn, the former La Pointe town jail, and the former Old Sailor's Home. More recently there have been modern additions to the museum complex, adding the Carter Center Exhibit Hall and a Walkway Gallery. 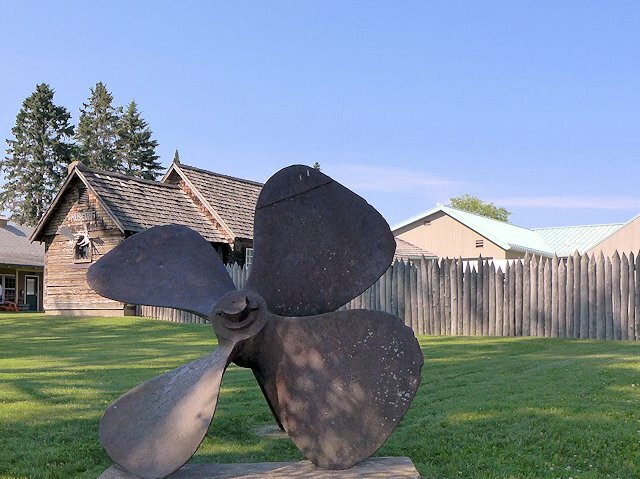 < < < An array of 19th century logging tools are displayed on the side of the original log museum. This structure is part of the last remaining building from the 1835 American Fur Company outpost. < < < Memorabilia from Michael Cadotte and Father Baraga. Other museum artifacts include items from early Ojibwa life, including a dugout canoe that was carbon dated to between 350 and 500 years old. < < < During the summer "Motion to Go" is one of the busiest enterprises in town offering scooters, bikes (including tandems), and buggies for rent. A great way to tour the Island. 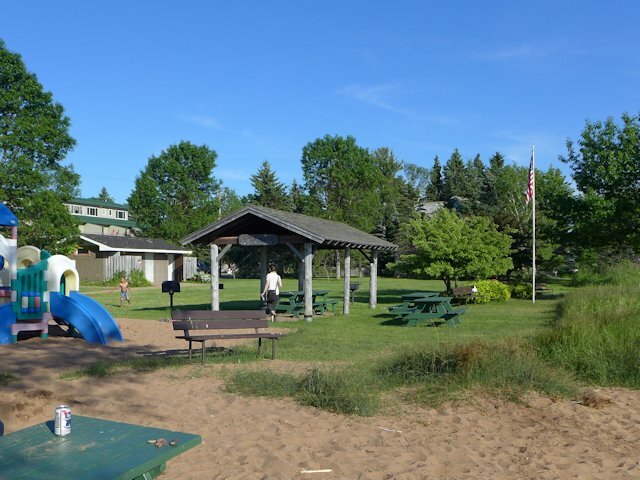 Swimming and picnicing is available in downtown La Pointe only a few blocks from the dock at the public beach. 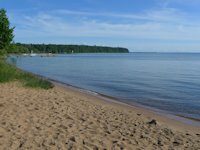 There are also nice swimming beaches in the town park and state park along Big Bay (7 miles from the dock). 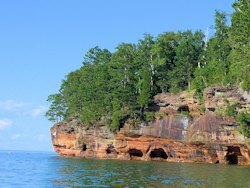 Madeline Island Golf Course. 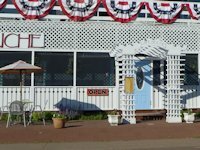 Golfers will enjoy a round at Madeline Island Golf Club, a Robert Trent Jones design with many unique features. Agate Hunting, Rock Picking and Beachcombing. 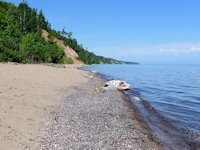 A remote beach on the north end of the island showed good potential for agate finds. 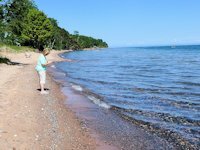 We also met a lady and her son doing some major league agate hunting at the Big Bay Township Park beach. 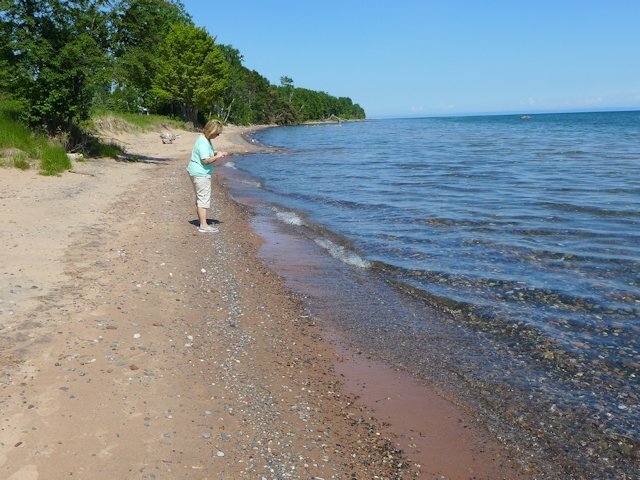 See more Agate Hunting Beaches here. 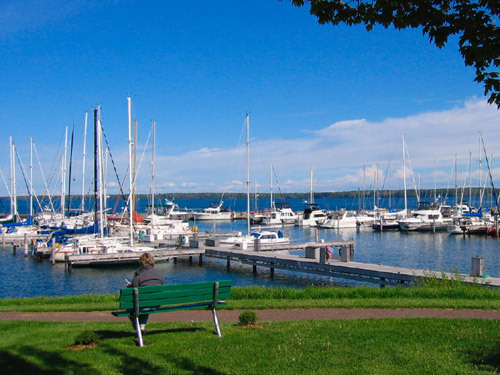 Bayfield is the gateway to the Apostle Islands and Madeline Island. 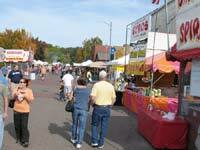 Fun things to see and do including great Burger & Pizza Bars in Superior Wisconsin.